Macrocystis integrifolia and M. pyrifera) are very similar and are differentiated by the shape of their holdfasts. While many researchers differentiate between the two, some algae specialists refer to them both as M. pyrifera due to their extreme similarity and their ability to hybridize. 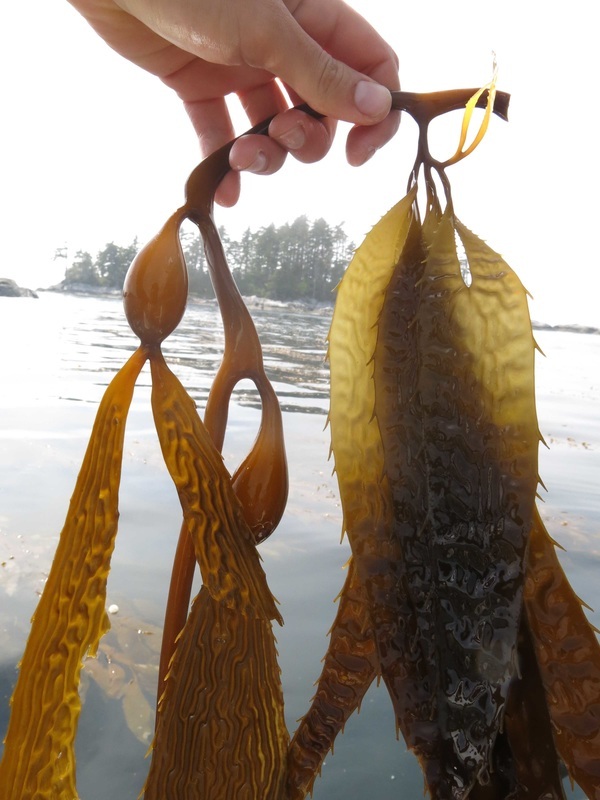 For this reason, and because often the holdfast is no longer attached to specimens found on shore, both of them will be discussed here as 'giant kelp' and differentiated by scientific name when required. Giant kelp is a many-branched algae with a long stipe and long, wide blades. The beginning of the blade takes the form of a hollow, elongated-pear-shaped float. The juncture of the stipe and blade (the float) is split; this split creates the stipe's branches.The blades do not have midribs, but tend to have an uneven texture, like the texture of a crinkled piece of paper. This brown seaweed (Phylum Phaeophyta) ranges in colour from brown to olive green. The holdfast of M. pyrifera is tall and shaped like a pear or pyramid, whereas the holdfast of M. integrifolia is flattened. Giant kelp attaches to rocks in the low intertidal and subtidal zones of moderately exposed shorelines (to a depth of 10 m or 33'). It can form extensive kelp forests Its range along the west coast of North America stretches from Kodiak Island, Alaska to Baja California. It is also found along coastal Mexico, Peru, Chile, Argentina, Tasmania, and New Zealand. Bull kelp (Nereocystis leutkeana) is the most similar to the two Macrocystis species. 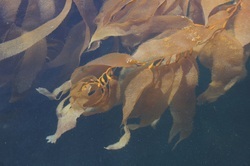 It has a larger, rounded float whereas giant kelp floats are smaller and pear-shaped, and four groups of blades attach to the float, while only one blade attaches to each giant kelp float. Giant kelp stipes are branched, leading to many floats per holdfast, and bull kelp stipes are unbranched. 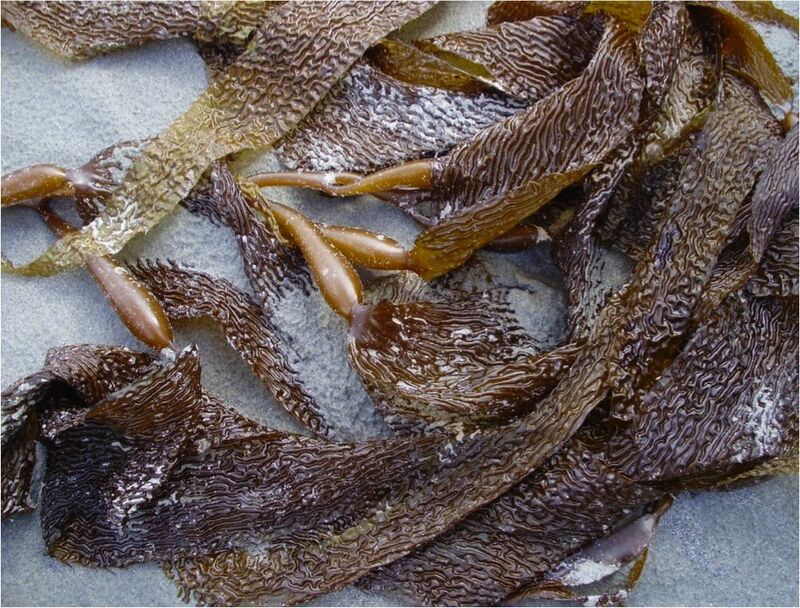 Giant kelp is edible, and is used to make "roe on kelp" - herring eggs attached to giant kelp blades. This is a specialty seafood product that is a valuable BC export, and is also harvested locally along the BC coast. 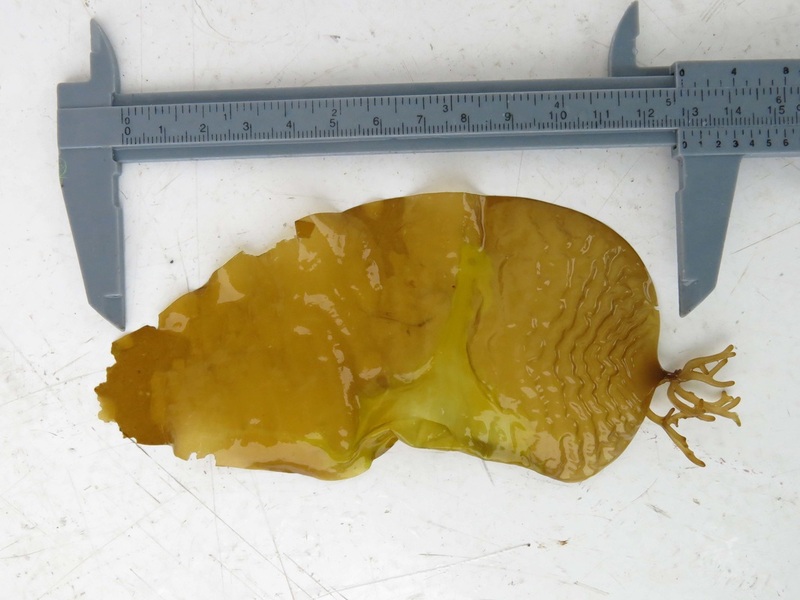 Click here to read a Pacific Wild blog post about harvesting this delicacy that looks like "an inside out piece of sushi." 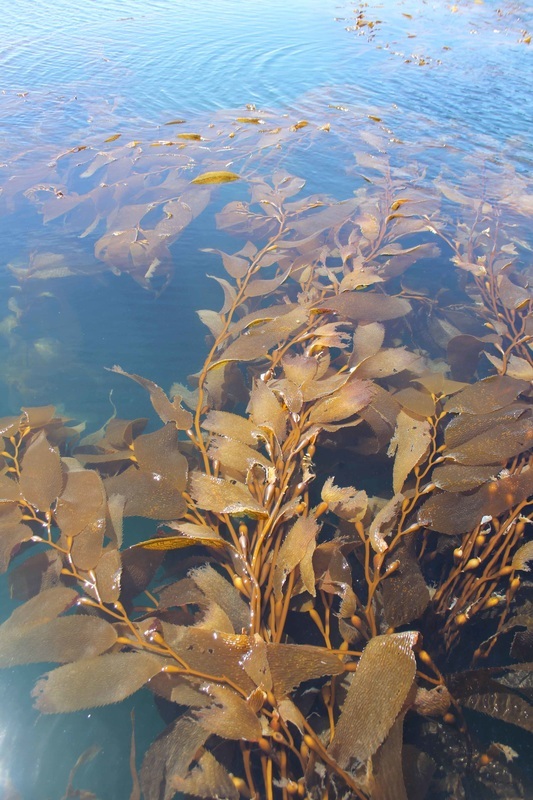 Giant kelp is also harvested for alginate, an extract that is used in certain food products like salad dressing. 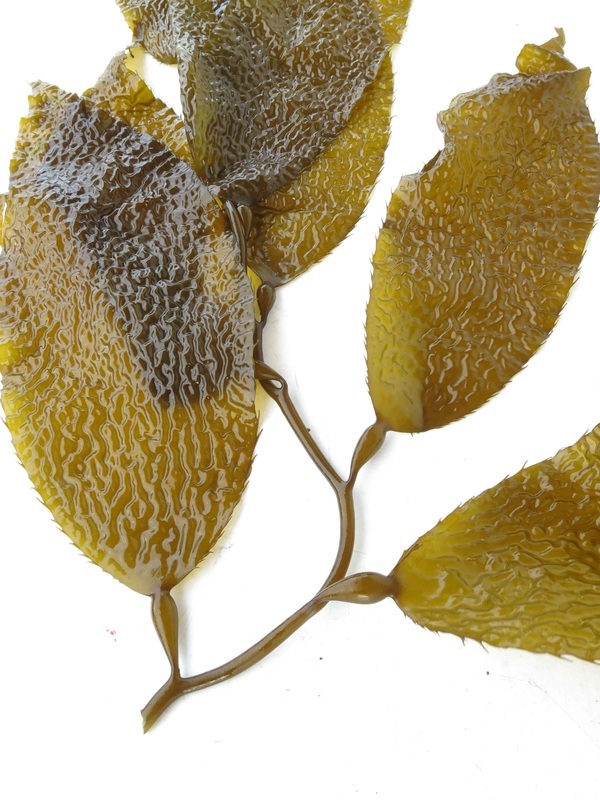 It is also harvested to make kelp tablets, which provide vitamins and minerals. 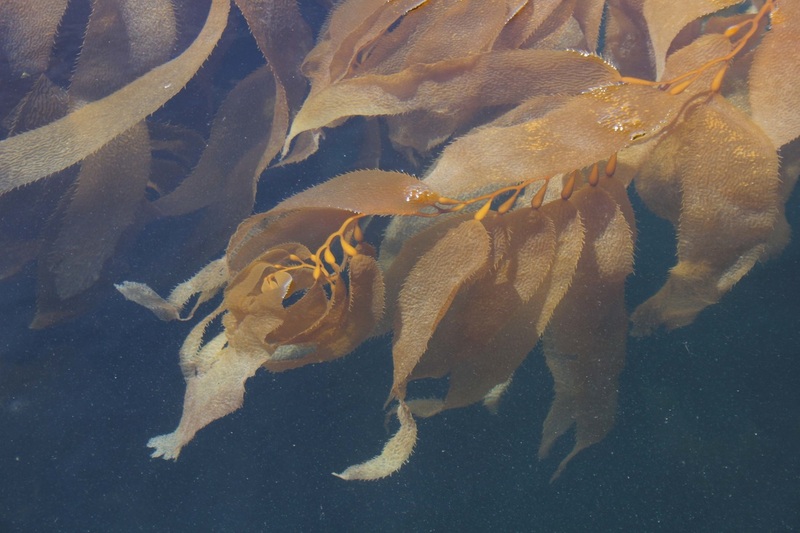 Giant kelp can grow up to 35 cm in a single day if environmental conditions are favourable. It may in fact be the world's fastest growing organism. Its nitrogen stores only last for two weeks, after which point it stops growing if no new nitrogen source is added. Giant kelp dies back each winter, and only its gnarled-looking holdfast remains until the next growing season. Individual plants survive for up to 8 years, but usually only last 4 to 5 years. 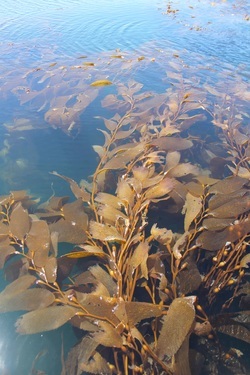 Giant kelp provides habitat and food to many species, and plays an important role in coastal marine ecosystems. It is a preferred food of northern kelp crabs, red sea urchins, and particularly purple sea urchins, and it provides shelter for many species of fish and marine invertebrates. The balance of kelp forest communities with sea urchin populations is precarious; when events like severe windstorms devastate giant kelp forests this balance is distrupted, and sea urchin populations can get out of control. The result is often an urchin barren - an underwater desert where normal food webs have been disrupted and community structure has been drastically altered. Sea otters, which prey on sea urchins, can have a similar impact on kelp forests. Low sea otter populations decreases predation on sea urchins, which may allow urchin populations to rise and consequently grazing on kelp forests may increase. Other abiotic and biotic factors play important roles in this balance, however, so it is never quite so simple. More information on this complex ecological balance can be found in this article. 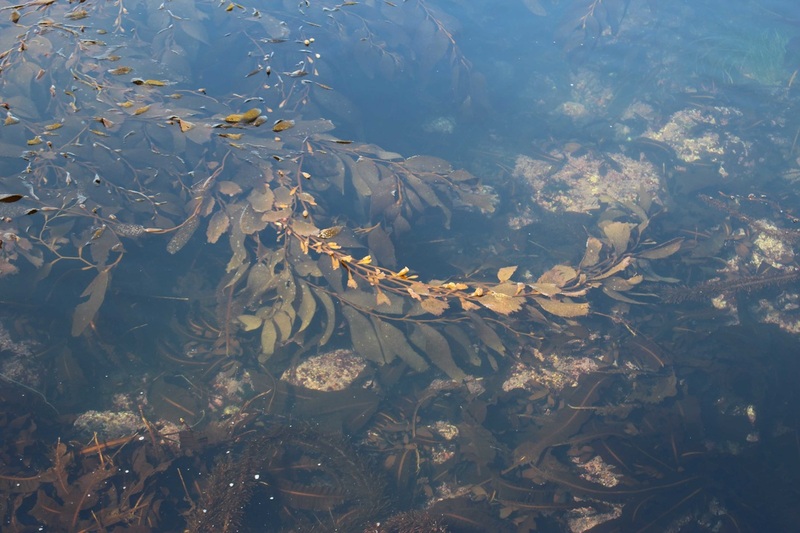 Giant kelp is well-studied because of its important ecological role. 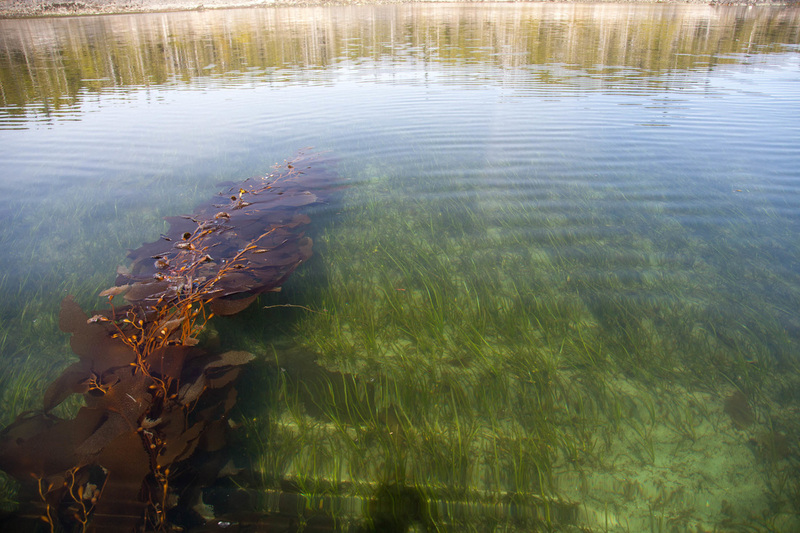 Read more about giant kelp's growth and reproduction on the E-Flora species page. Photos by Jenn Burt (left and top middle, of young specimens), Elizabeth Bailey (bottom middle), and Ian Thomas. Harbo, R. M. (1999). Whelks to whales: Coastal marine life of the Pacific Northwest. Madeira Park, BC: Harbour Publishing. P. 206. 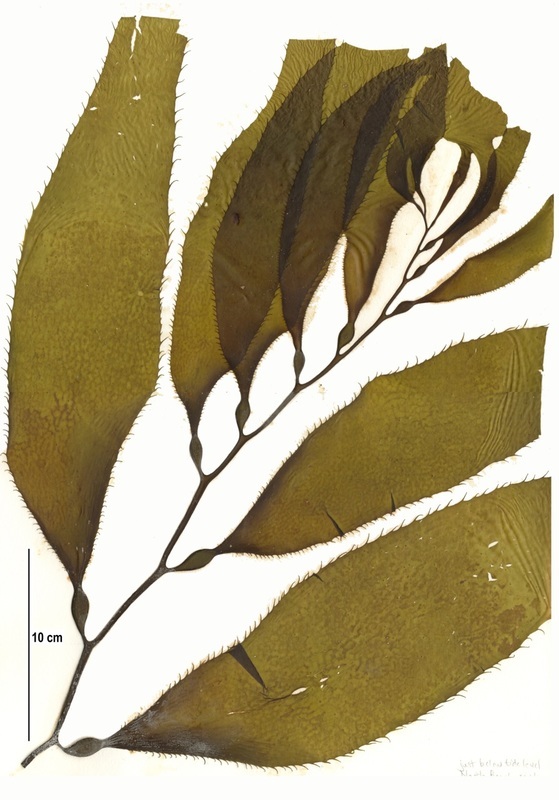 O'Clair, R. and Lindstrom, S. Macrocystis pyrifera (Linnaeus) C. Agardh, 1820. In Klinkenberg, Brian. (Ed. ).E-Flora BC: Electronic Atlas of the Plants of British Columbia. Lab for Advanced Spatial Analysis, Department of Geography, University of British Columbia, Vancouver. Accessed 23/08/2013.